The UK’s farm shop sector is on an upward trajectory. Heightened consumer concern about health, environmental and welfare issues has resulted in increased interest in the provenance of the food we eat. More of us, it seems, are voting with our feet and shopping local. This is all great news for farm shop owners. But getting customers through the door is only one part of the challenge. 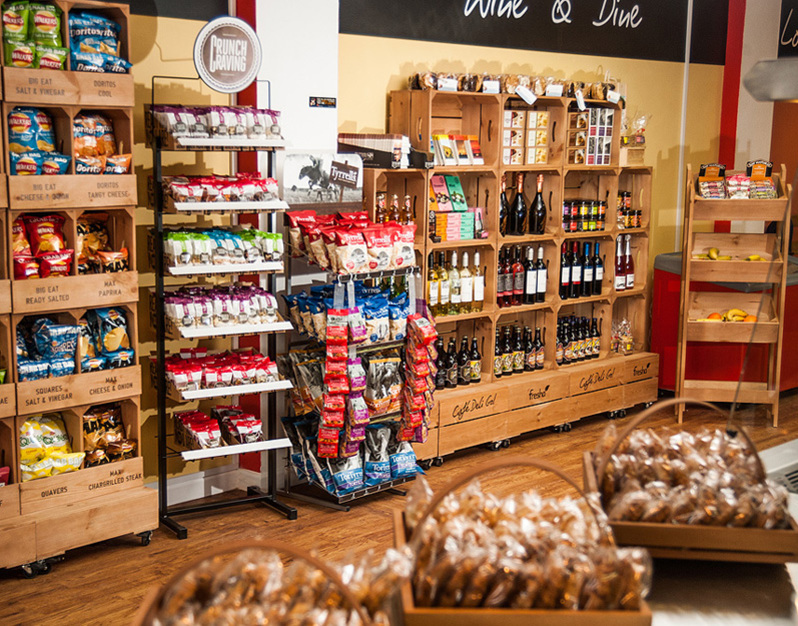 Turning footfall into profit margins depends as much on creating the right shopping environment as offering the right produce – and that means creating a farm shop display that is visually appealing, as well as functional. When deciding on the visual aesthetics of your farm shop display, it pays to consider the profile of your customers and the kind of shopping experience they will respond to best. Generally speaking, farm shop customers are environmentally and ethically minded consumers. Words that might define their expectations include ‘natural’, ‘wholesome’ and ‘organic’, so a farm shop environment filled with plastic shelving and crude artificial lighting, for example, would be incongruous. Rustic wooden display units, on the other hand, work extremely well in a farm shop environment. There’s nothing unnatural or pretentious about real wood and its simple style offers the perfect backdrop for showcasing wholesome produce. Choose a supplier who offers a range of different-sized units - from tall free-standing shelving units to angled shelf counter-top displays - to create interesting variety within your display and make sure there is a consistent theme across your entire product range. Rustic farm shop display furniture doesn’t have to be boring. We think natural wood looks amazing but if you choose a supplier who can also create a few bespoke panels that are colour-matched to your branding, you’ll have an eye-catching pop of colour that not only adds to the visual appeal of the display but also makes it totally unique to you and instantly recognisable as your brand. Even better, to really make your farm shop display units work hard for you, choose a supplier, like Furniture Crates, who can print your logo and graphics onto selected display panels. Every opportunity you get to promote your brand as part of your customers’ shopping experience is a valuable opportunity to build customer loyalty and trust. 3. Functionality: Choose Farm Shop Display Furniture That’s Up To The Job! Farm shops tend to be a bit rough around the edges, often created from the conversion of farm outbuildings. In addition, fresh produce is typically brought in straight from the field and usually comes with bits of the field still attached! Other local produce - contained in jars, tins and bottles - can present the dual challenge of being both heavy and fragile. Farm shop display furniture, then, must satisfy many different demands; it has to be strong, durable, easy to clean and easy to move – as well as being aesthetically pleasing. Fortunately, as well as being visually attractive, rustic wooden shelving units tick all the boxes here, too, even more so if free-standing units are fitted with lockable wheels for easy manoeuvrability. Wood is, after all, a beautiful, natural material that’s capable of withstanding a few knocks, won’t show dust and will stand the test of time. Just be sure to choose from a supplier who builds their farm shop furniture from sustainable, FSC certified wood if you want to confirm your ethical and environmental credentials. When you’re looking for farm shop display furniture it can be tempting to pay a company to both supply and fit it all for you but, beware, labour costs for shop fitting can really add up. It’s also highly unlikely that the configuration you start out with will remain permanent: farm shops need the flexibility to rearrange their retail displays to take account of seasonal variations, promotions, and new supplier relationships. So, when choosing your farm shop display units, it pays to source free-standing units that either come pre-assembled or can quickly and easily be self-assembled, without the need for a complex array of tools – or an army of shop fitters. Finally, the popularity of farm shops is growing and, hopefully, your business will too. With this in mind, it pays to choose farm shop display units that are modular in nature and can easily be re-configured or added to at a later date in order to accommodate growth and/or change. If you’re looking for farm shop display ideas why not take a look at our Furniture Crates’ range of wooden retail display units, all hand-crafted in Devon from sustainable wooden crates. With a wide choice of colourways, including striking two-tone options, and pixel-perfect digital printing options, we create bespoke farm shop displays that are as unique as you are. All of our display units are easily assembled and, through the use of metal latches, can be joined in many different configurations, making it easy to re-arrange or add to your display.